MOST of the focus in the lead-up to this weekend's AFL's women's match has understandably been on the players representing Melbourne and the Western Bulldogs on the big stage at Etihad Stadium. But the three female umpires in charge are also making their mark in footy. Eleni Glouftsis, Libby Toovey and Annie Mirabile are highly rated young whistleblowers rapidly motoring along the umpiring talent pathway. Glouftsis, 22, already boasts significant experience, and is officiating in the VFL and TAC Cup competitions while training with the AFL umpire squad under the tutelage of Hayden Kennedy. She described the chance to work with the AFL umpires as "the opportunity of a lifetime". With an eye on becoming the AFL's first female field umpire, Glouftsis moved to Melbourne from her native South Australia at the end of last year to take up a three-year AFL scholarship. Combining her job as a teacher with her umpiring and training responsibilities, Glouftsis has impressed with her commitment and ability. "It was a pretty big decision (to move to Melbourne) but I'm really passionate about umpiring and wanted to see how far I could go," Glouftsis said. "The AFL umpires have been fantastic. They're welcoming and happy to give me advice on how I can improve. "I simply want to do the best I can, whether I'm the first or the 30th female to umpire in the AFL doesn't matter. I'm just keen to chase my own goals," she said. 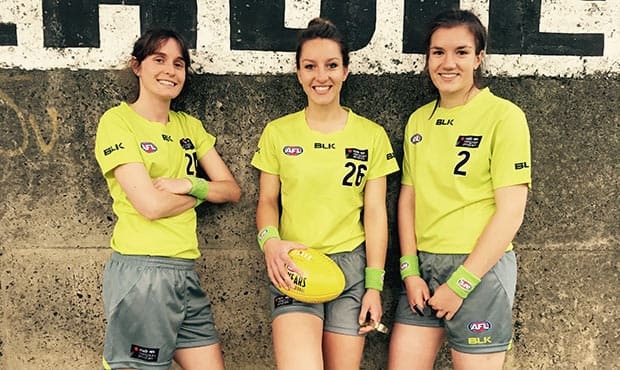 The oldest of the trio, Libby Toovey, is also receiving expert coaching as part of the AFL Victoria Umpiring Academy while officiating mainly in TAC Cup matches. "I tried out for the academy last year and missed out but was determined to try again this year and was lucky enough to be given an opportunity," Toovey said. "It's a big step up but something I'm really enjoying." Completing the trio is 21-year-old physiotherapy student Annie Mirabile, a rookie umpire with the AFL Victoria Academy. "I umpire in the Southern Football League each weekend but train with the state squad once a fortnight, which has been great for my development," Mirabile said. "I have had to work really hard on my fitness and while it has improved, I know I have to continue to build it up." Mirabile said the extra attention on Sunday's game had created some nerves but she was looking forward to the challenge. "I'll have a bit of a support crew there and it's been funny to see a lot of my uni friends who are little surprised I'll be doing a game like this," she said. "I fell very lucky to be given this opportunity. I just have to treat it like a normal football game and make the most it." The Melbourne-Western Bulldogs women's match starts at 12.35pm Sunday as the curtain-raiser to the AFL match between the two teams at 3.20pm. Watch the match live on Channel Seven or on your mobile or tablet at m.afl.com.au/womens or via the AFL Live app.